Everything you need to know about moving to a new housing authority. “Portability” in the Housing Choice Voucher (HCV) program refers to the process through which your family can transfer or “port” your rental subsidy when you move to a location outside the jurisdiction of the public housing agency (PHA) that first gave you the voucher when you were selected for the program (the initial PHA). The agency that will administer your assistance in the area to which you are moving is called the receiving PHA. New families have to live in the jurisdiction of the initial PHA for a year before they can port. But, the initial PHA may allow new families to port during this one-year period. IF THE HOUSING AUTHORITY HAS NOT CONTACTED YOU REGARDING PORTABILITY, YOUR PAPERWORK HAS NOT BEEN RECEIVED, AND YOU NEED TO CONTACT YOUR ORIGINAL HOUSING AUTHORITY. • The Rosenberg Housing Authority (RHA) is currently billing. • It is the responsibility of the Initial Housing Authority to send all required paperwork to the RHA. • The RHA will generally schedule an interview with the porting participant within 2 weeks of receiving the necessary paperwork. 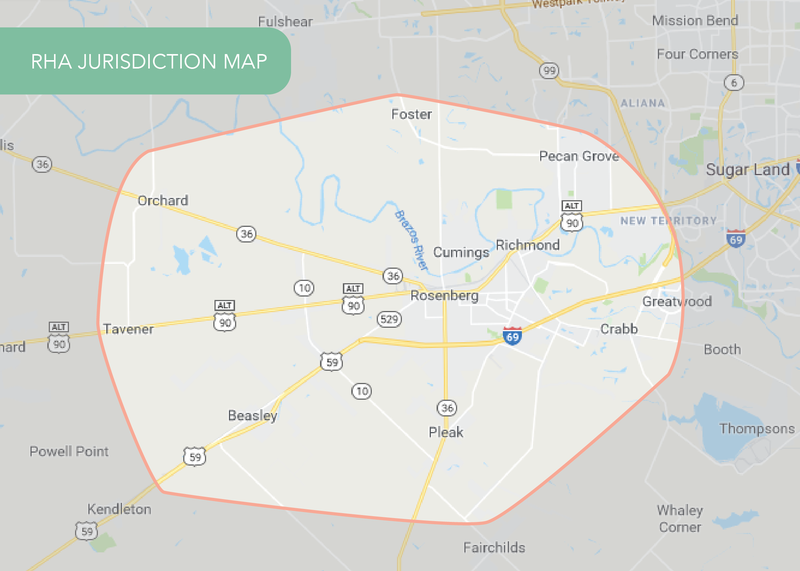 • Regardless of the voucher size your initial PHA gives you, the Rosenberg Housing Authority will use 2 people per bedroom to determine your voucher size. • A jurisdiction map is located here. • A list of apartments in the area is located here. In order to port to the Rosenberg Housing Authority, all portability paperwork must be sent to kbrown@rosenbergha.org or faxed to 281-232-2920. 1. The receiving PHA will issue you a voucher to search for a unit in its jurisdiction. Your voucher must be extended by 30 days from the expiration date on the voucher issued by the initial PHA. to the receiving PHA once you find a unit, so that the receiving PHA can determine whether you may rent that unit under the program. 3. If you decide that you do not want to lease a unit in the area, the receiving PHA will return your voucher to the initial PHA. The initial PHA is not required to, but may, extend the term of your voucher so that you may search for a unit in the initial PHA’s jurisdiction or port to another jurisdiction. YOU WILL BE GIVEN A 60 DAY VOUCHER FROM RHA THAT COINCIDES WITH YOUR CURRENT LEASE EXPIRING. EVEN IF THERE IS TIME REMAINING ON YOUR NEW VOUCHER FROM THE HOUSING AUTHORITY YOU PORTED TO, YOU MUST VACATE YOUR CURRENT UNIT ONCE THE LEASE EXPIRES BECAUSE ROSENBERG HOUSING ASSISTANCE WILL STOP.